Situated at an altitude of 1370 m above sea level, Bhimtal is an ancient town which is known for its temples, which are located amidst the majestic mountains and a clear blue lake. It is a place which lies close to Mother Mature which enables you to experience a sense of inner peace as you close you eyes and take in all the beauty of the place. 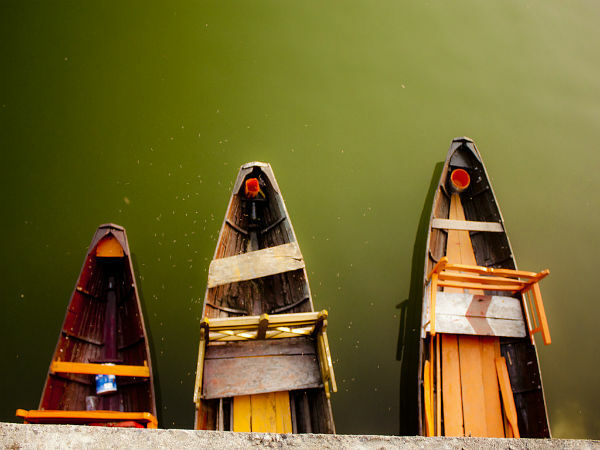 Bhimtal is an ideal weekend escape for those from Delhi. The Bhimtal Lake, with a small island at its middle, adds an extra charm to the beautiful surroundings which are bound by dense woods of oaks, pines and different shrubs along with lakes and a pleasant weather, which would cast a mystical spell on its visitors. Like most other hill stations in the country, Bhimtal can be visited anytime during the year. However, the best time to visit the place is considered between the months of March to June and September to December as the weather remains pleasant during these times. By Air: The nearest airport is the Dehradun airport which is located at a distance of 182 km from here. The airport offers flights to most of the major airports across the country, such as Delhi, Mumbai, Bengaluru, Kolkata, etc. By Train: The nearest railhead to Bhimtal is the station at Kathgodam which is located 30 km away from here. The station has regular trains which operate to Delhi and other cities across the region and is considered the gateway to the Kumaon region. By Road: One of the best ways to reach the place is by road, as the place has excellent connectivity of road transport with regular bus services to most of the major towns and cities across the region. The total driving distance from Delhi to Bhimtal is about 315 km. One can reach Bhimtal from Delhi via the NH 9; it would take about 7.5 h to cover a distance of 312 km. The national highway passes through the various suburbs of Delhi and through a number of towns in the state of Uttar Pradesh before reaching the destination. Another route which can be taken from Delhi to Bhimtal is via the Upper Ganga Canal Road, which would take one about 9.5 h to cover a distance of 355 km. The road takes you through some of the towns in the state of Uttar Pradesh, such as Bijnor, Kashipur, etc., before reaching Bhimtal in the state of Uttarakhand. If you opt for the route via NH 9, you can make stops at the small towns en route where you could eat at the local dhabas. The place gets its name from the second Pandava prince, Bhima, who said to have visited this place during the exile period and constructed the Bhimeshwara Mahadeva Temple here. The town is considered to be older than Nainital and is said to have been part of the ancient silk route. Bhimtal was ruled by the kings of the Chand dynasty before coming into the hands of the British after the Anglo-Nepalese War, which was fought between the year 1814-16. The place was pit stop for the people who used to trek to the neighboring countries of Nepal and Tibet. This ancient route, which connects the hills to plains and vice versa, is still operational. The C-shaped Bhimtal Lake was built in the year 1883 along with a masonry dam, named after Bhima. The lake is the largest in the entire Kumaon region. The lake provides the water required for irrigation purposes and is home to a large variety of fish. One can find an island at the centre of the lake which has been converted into a tourist attraction and houses an aquarium, which is open to the public. Situated on the banks of the lake, the Bhimeshwar Mahadev Temple dedicated to Lord Shiva originally is said to have be construct by Bhima, the second Pandava prince, during their exile period. However, the present structure dates back to the 17th century, which was built by Baz Bahadur, who was a king in the Chand dynasty and the ruler of the Kumaon region.